If you’ve bought a new car in recent years, the chances are that you won’t find a spare wheel. But be honest, have you taken the time to examine the alternative emergency puncture solution that the manufacturer has bought in as an alternative? If not, I suggest you do so promptly. And if under the boot (trunk) floor you discover an aerosol, you have a problem. The physics of the situation are that only a thin weedy latex-based sealant can go through the nozzle, and it has a very limited puncture sealing ability. The other problem is that the gas inside the aerosol is unlikely to be sufficient to reinflate your tyre to a sufficient pressure to be safe and to be equal to that of the opposing tyre. The other alternative is that you have been supplied with a compressor & tyre sealant package. That’s better news: but you need to be aware of the kit’s potential limitations. Let’s look at the two types that exist. Forgive me if this is something you already know, but many people are unaware that car tyre valves have a removable central section – the valve core. This can easily be unscrewed using a slotted tool called, unsurprisingly, a valve core remover (VCR). That allows you to let the air out – if there is any left – and open the valve stem. Then you can inject the sealant through the hole. and drive to seal the puncture. The second type avoids the need to unscrew the valve core – the compressor and sealant are pre-connected. In the ‘through-valve’ types, the hose attachment presses in the valve core and the sealant is then forced in by the pressure of the compressor unit. Then you switch the compressor over to air supply mode and it inflates the tyre. So there is a slightly quicker process, and it is superficially attractive to make it simpler. But you should also be advised of the downside. Just as with the aerosol can, the through-valve sealant has to be very thin and weak to be able to get through the extremely small cavity that is created when you press in the visible button of the valve core. Even the car makers usually have to admit in their data sheets that such systems will only seal up to 3mm diameter holes. And note the ‘up to’. The sealant is latex-based – it coats the inside of the tyre with a sticky chemical mixture that is hard to remove from the rubber, and most tyre bays will refuse to repair the tyre even if it is otherwise suitable for vulcanisation. Most such sealants use natural latex which causes allergies in a lot of people; and you must therefore be very careful not to come into contact with it. Having used your sealant bottle you will want to replace it for the next time: you then discover that it is a bespoke sealed bottle unit, it is considerably more expensive than regular sealants and you cannot top it up. One of the joys of having a compressor unit in the household is the ability to use it for any other tyre or inflatable. Most original equipment car systems do not come with adapters for balls and inflatables, and some cannot be used in ‘air only’ mode. You will look in vain for any assistance for those punctures that happen on dark nights in dangerous places – most kits do not come with a light unit or a flashing red light to warn approaching traffic. And finally, check your supplied sealant for its expiry date. That’s right, the clock is ticking on your sealant and you will have to replace it at your expense. A lot of these drawbacks afflict even those original car kits that are two-piece straightforward designs. They also all, whichever type they are, make the false economy of using a circular analogue dial that is chronically inaccurate and can read up to +/- 3psi out from the real pressure, with a consequent reduction in tyre life due to incorrect inflation. 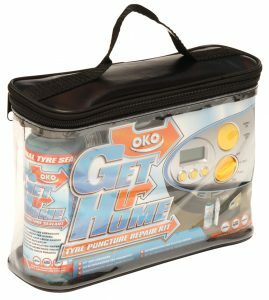 OKO’s worldwide distributors are buying in stocks of this great product – so if you haven’t yet found it on the market, contact them via ‘Find a Distributor’ or use our ‘Contact Us’ form.